I’m calling these ‘tacos’ because I’ve used lettuce leaves instead of tortillas. But don’t let that put you off. They’re super delicious and with the fresh zesty hot sauce your taste buds will be happy! 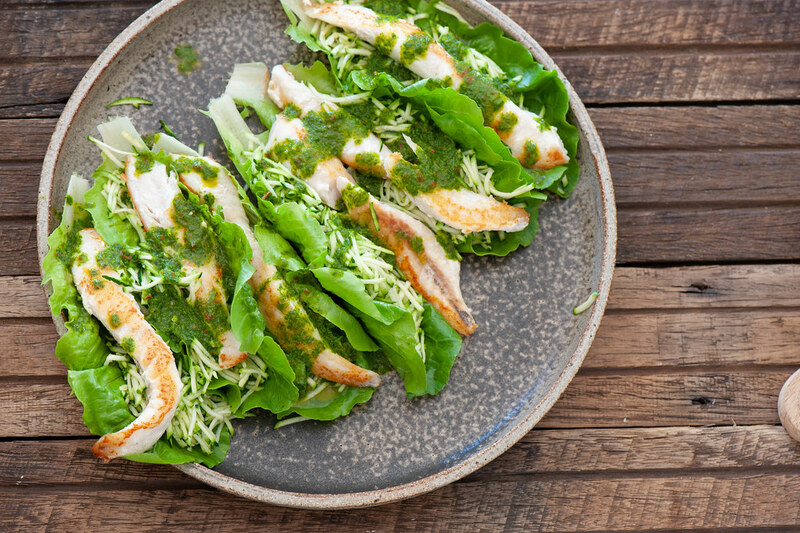 If you’re using the lettuce leaves it’s a pretty light meal. So see the more substantial options below if you’re feeling hungry. 1. For the sauce, chop coriander (cilantro) leaves and stems coarsely. Place in a tall jug or wide mouthed jar large enough to fit your stick blender. Add chilli, 4 tablespoons extra virgin olive oil and lime juice. Blitz using your stick blender until you have a pureed vibrant green sauce. If you don’t have a stick blender, use a food processor, regular blender of chop everything by hand. 2. Heat a medium frying pan on a medium high heat. Season fish with a pinch of salt. Add a splash of oil to the pan and cook fish for 2-4 minutes on each side or until browned and cooked through. 3. Fill 6 lettuce leaves or zucchini tortillas with the grated zucchini. Top with 1 piece of fish for each leaf / tortilla. Serve with hot sauce drizzled over. WINE MATCH: A cold beer or glass of pinot gris. 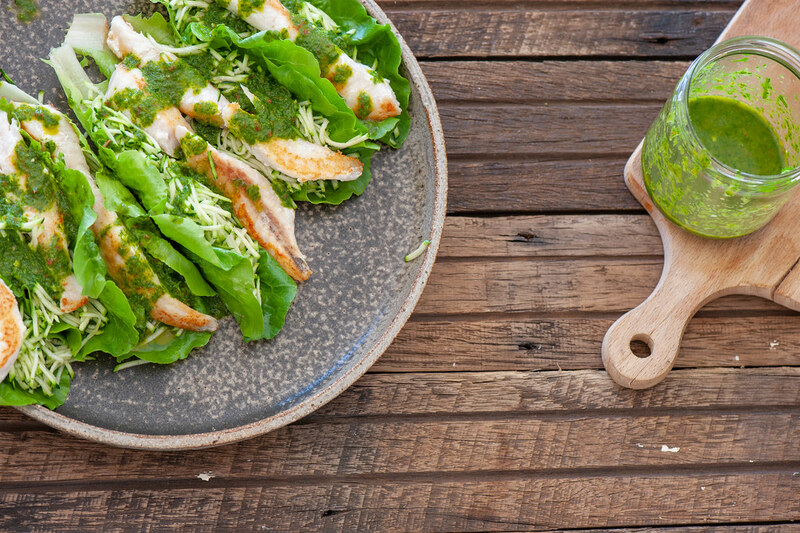 taco bowls – serve shredded lettuce and grated zucchini in two bowls then top with hot fish and the green sauce. short on time – use a commercial hot sauce instead. vegetarian – fish = pan fried halloumi cheese or fried eggs. more substantial (carb lovers) – warm tortillas or flat bread. more substantial (low carb) – serve with mayo, sour cream, avocado, peanuts, almonds or roast cashews. Using the zucchini tortillas makes it much more filling than the lettuce leaves. family friendly – skip the chilli pepper. different herbs – basil or parsley. carnivore – pork fillet, pork sausages, chicken thigh fillets are all lovely with the sauce. no lime – use lemon juice. crispy fish – dust fish with almond meal or another flour before pan frying. fish fillets – freeze the fillets alone or you could make the fish cakes and freeze the mixture ready to defrost and cook. lettuce – will keep in the fridge for a few weeks in a plastic bag. Otherwise use for another meal as it’s not great once frozen. zucchini tortillas – freeze them. No. Everything is best when freshly made! Leftovers will keep in the fridge for up to a week. Don’t freeze.